Well made with a simple design. I highly recommend! 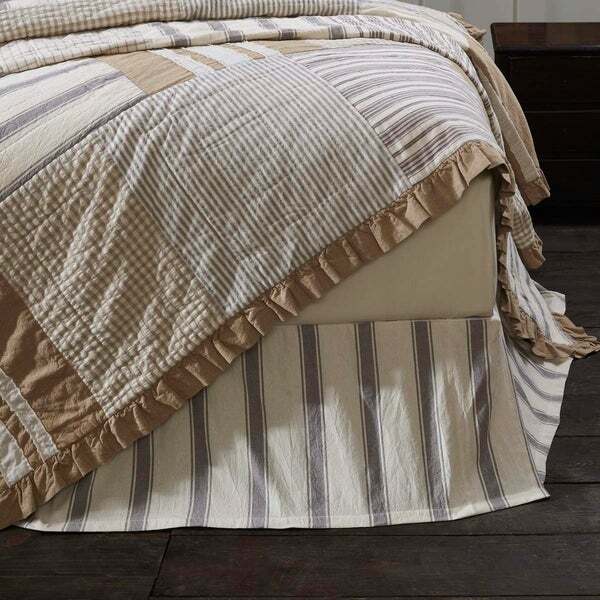 I enjoy the Grace Cotton Bed skirt, I'm pleased with what we finally bought, I order the King size and it fit perfect. It's long enough to fit around my Cal King bed, the stripes or gorgeous. I love shopping at overstock.com they have every thing. It’s a really nice looking bed skirt, but has an odd smell out of the package. Recommend washing before putting it on the bed. Otherwise, very pretty rustic farmhouse look and the neutral colors coordinate with many different bedding patterns. Beautiful quality and colors. Love the fabric. Very unique. Will look great for the farmhouse style bedroom combining both white and cream colors together. Fast delivery! The picture looks white with stripes, so even though the description said creme I thought it would be more on the white side based on the picture. Very disappointed, and then I had to pay $**. to ship it back!!!! Very well made! Love it! Definitely recommend this! "Is the bed skirt made with a bright white or cream colored background?"